The French Polynesian Islands are incredible and the names themselves evoke dreams of tropical perfection. Yes, Paul Gauguin definitely had a point when he exiled himself to French Polynesia, specifically Tahiti. Think green mountainous islands in crystal clear waters; when you think pacific, you think Tahiti and Hawaii perhaps… . 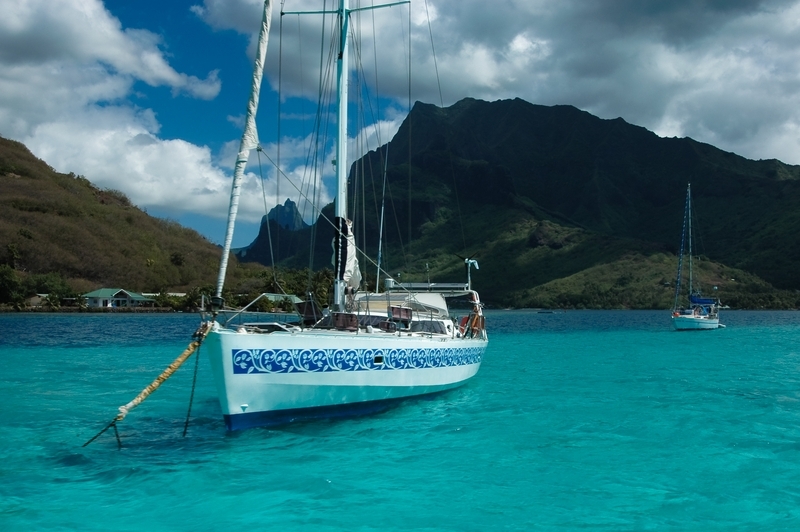 the latter not being particularly charter- friendly due to the generally high swells and waves – more suitable for surfing than sailing but Tahiti yacht charters are definitely a yachting paradise. And, yes, we can also put you on a bareboat in Tahiti, with or without skipper, on a nice new boat and a beautiful bunch of islands to visit. Of course we recommend the full treatment of a luxury crewed motor yacht or sailing catamaran or mono-hull with all the trimmings. Lap of luxury and pampered all the way. If you are a DIY boater, there are several reputable bareboat companies that operate in Tahiti, including the Moorings, Sunsail, Dream Yacht and others. We are booking agents for all these companies, many times with better pricing than if you approach them directly. Tahiti yacht charters are great any time of year but here are the rain and temperature averages: November to April is the wet season, the wettest month of which is January with 13.2 in (340 mm) of rain in Papeetē. August is the driest with 1.9 in (48 mm). The average temperature ranges between 21 °C (70 °F) and 31 °C (88 °F) with little seasonal variation. The lowest and highest temperatures recorded in Bibys are 16 °C (61 °F) and 34 °C (93 °F), respectively. Tahiti is a fully established and recognized “Department” or Province of France. French is the official language although the native language Reo Maohi, is widely spoken. If you have any questions about our Tahiti Yacht Charter offerings call us at (877) 759-8263 or contact us by email today.